My husband and I spent many years in a miserable state. I’m ashamed to tell you that this list is a result of some of the ways I was guilty. Several ways, actually. I’d love for you to learn from the mistakes I made over the years. It’s something that was settled long ago (or maybe just last week), and you just can’t seem to let it go. We’ve all failed. Let go of things that have already been worked through and settled. If there are unresolved issues that were never dealt with biblically, don’t bring them up to use as a bully club but take steps to graciously resolve them and move on. 4. You expect him to be just like your girlfriend. He’s probably not a crafter, a scrapbooker, or a fan of spending five hours at the mall. An afternoon in the nail salon is probably not his idea of fun. He’s not going to communicate with you like your best friend or want to know the complete story you want to tell—down to the very last detail. Appreciate him for being a man, and leave the girl stuff to your girlfriends. Men know they don’t think like we do. They know that it can be challenging to measure up to our expectations or desires. When they forget to close the lid on the toilet, it’s not because they want to irritate us. When they take the long route because they forgot the right exit, it’s not because they want to burn that extra gas. When we talk to our husbands in the same tone we would use with our children, it’s disrespectful. And that’s a sin. 7. You unload the big guns at 11 p.m.
8. You compare him to that “perfect guy” at church. Your husband may not seem as “spiritual,” may not treat you the same way you see that “perfect guy” treat his wife, may not sound as knowledgeable, or seem as interested in the sermon. But your husband probably has some worthy qualities that you may be missing because you’re so focused on what he’s “not.” Rather than comparing him to another man, why not ask God to open your eyes to see things that you’ve not yet appreciated about him? I hope I haven’t seemed harsh. It’s just that I know how easy it is to slip into a disrespectful attitude that morphs into ugly treatment of those we love most. I’m challenging all of us today to set aside any of these things that are a common, but destructive, tendency in marriage. I hope you’ll ask God to show you if anything on this list is true of you. If so, spend some time seeking God. 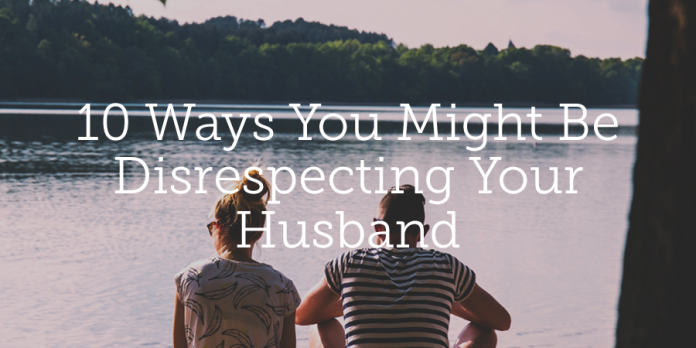 Then ask Him to show you specific things you need to ask your husband to forgive you for, and share that with him.